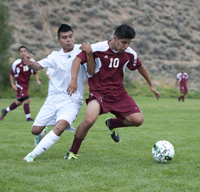 Wood River’s Jose Ortiz (left) and Canyon Ridge’s Oscar Delatorre tangle during Wednesday’s Great Basin Conference tie game on the Hailey pitch. It didn’t take long for the new Great Basin Conference soccer tiebreaking rule to come into play as the Canyon Ridge Riverhawks and Wood River Wolverine boys battled to a 1-1 tie Wednesday after 80 minutes of hard-fought regulation play in Hailey. And it didn’t take long for the skeptics of the rule change to chortle quietly to themselves—since each team made three of their five penalty kicks in the decisive shootout to keep the game exactly where it was after 80 minutes, dead even, a point for each team in the league standings. Wood River out-shot Canyon Ridge 12-8 for the game and had the better of it in the second half, out-shooting the visitors 8-3 with 3-1 advantages in both corner and direct kicks after the half. ‘Hawks senior Oscar Delatorre scored on a penalty kick in the ninth minute and Wood River senior striker Zac Miczulski snuck past the Canyon Ridge defense for an unassisted goal in the 73rd minute to equalize the score at 1-1. The outcome went to one set of penalty kicks, five players a side. They were alternating kicks against Canyon Ridge’s fine senior keeper Josh Clark (10 saves) and Wood River junior keeper Kyle Weller, who had kept his team alive with four great saves out of his game-high 11. Clark took Canyon Ridge’s first kick and made it, then moved into the net and stopped Jon Scott’s first attempt for Wood River. ‘Hawks senior Efrain Venegas hit the crossbar on the second attempt and it flew over the net, no good. Senior Drew Morse had better luck when his shot hit a post and went in. It was 1-1 after two shooters. Next up was ‘Hawks junior Cristian Muniz, who drilled one into the left corner for a 2-1 lead. Clark came up big again for Canyon Ridge, using his athleticism to save Chandler Gifford’s bid with his foot. Fortunately for Wood River, the fourth ‘Hawks shooter, junior Hadir Saad, probably the best player on the field for the ‘Hawks in the game, cuffed his shot and the ball dribbled slowly wide, no good. That left Wood River senior Jose Ortiz with a big opportunity and he made no mistake, beating keeper Clark in the left corner. The fifth and final shooters, junior Keion Peterson of Canyon Ridge and senior Andrew Graves of Wood River, both made their shots to keep the game as a conference tie. Wood River (1-0-3, 1-0-2 league, 5 points) stayed behind league-leading Canyon Ridge (6-0-1, 3-0-1 league, 10 points), although the ‘Hawks have played one more league game. Canyon Ridge has 2-1, 4-1 and 2-0 wins over Jerome, Twin Falls and Burley, while Wood River has beaten Burley 4-0. The Wolverines had a “shaky start” in Wednesday’s game, Monjaras said, in large part because the Hailey boys took time adjusting to Canyon Ridge’s strategy of short passes and strong defense in front of the league’s best and most experienced keeper, Clark. In their first home game, Wood River battled through some adversity. Senior Eron Bates, a second-team All-GBC defender/midfielder, tried to play with a knee injury he suffered playing football for Wood River last week, but he pulled himself out early in the game. Senior Stephen Pfeiffer was one of Wood River’s speedy creators up front in the second half, but he left with a double leg cramp after making an incredible one-timed shot that just went wide at 60 minutes. Goalkeeper Weller was incredible. In the 21st minute he stopped ‘Hawks star Saad cold on a close-in shot. He leapt and tipped a rising Saad bid over the net and out of danger at 48 minutes. Then he stymied Cristian Muniz twice, once in the box after a great pass from Saad, and in the final minute after Muniz got behind the defense for a great chance. Wood River entertains the Bonneville Bees from Idaho Falls Saturday at 11 a.m. and then has Jerome at home Monday, Sept. 16 at 4:30 p.m. Jerome (2-2-0, 1-2-0 league, 3 points) lost 2-1 at Canyon Ridge and 3-1 at home to Twin Falls this week, to go with its 6-0 victory over Minico.